All pools should have a fence with a self closing-self latching gate, at least four feet high. 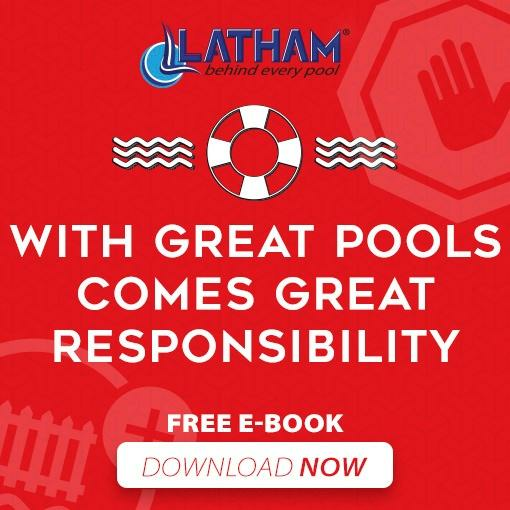 Talk with your Latham Dealer about installing additional safety devices like pool surface alarms, safety covers and child-safety barriers that meet your local building and safety codes and guidelines published by the Association of Pool and Spa Professionals. Safety ropes should always remain in place. Smart pool owners always think safety first. They take specific steps to ensure that their family, friends and guests are aware of the safe and sensible use of the swimming pool — and urge these people not to use the pool if they are under the influence of alcohol, drugs, stimulants or any other substance that might impair their abilities. Latham Pool Products strongly recommends the use and careful placement of all safety stickers and signs included in your Owner’s Safety kit. It’s also a good idea to contact your local American Red Cross for available CPR courses and other vital safety programs.